Whether steps are inside or outside, there are plenty of hazards that can lead to unwanted slips and falls. With Sure-Foot’s industry-leading technology, BOLD STEP® aluminum stair treads offer an eye-catching, resilient anti-slip product to create secure steps. 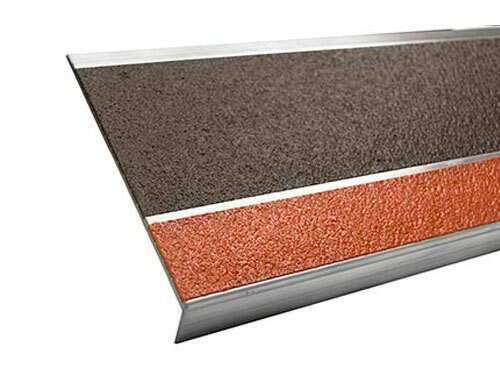 Sure-Foot’s 9” Orange & Brown Double Cavity Aluminum Stair Tread has customizable options to allow stairs to match the overall design of its surroundings.